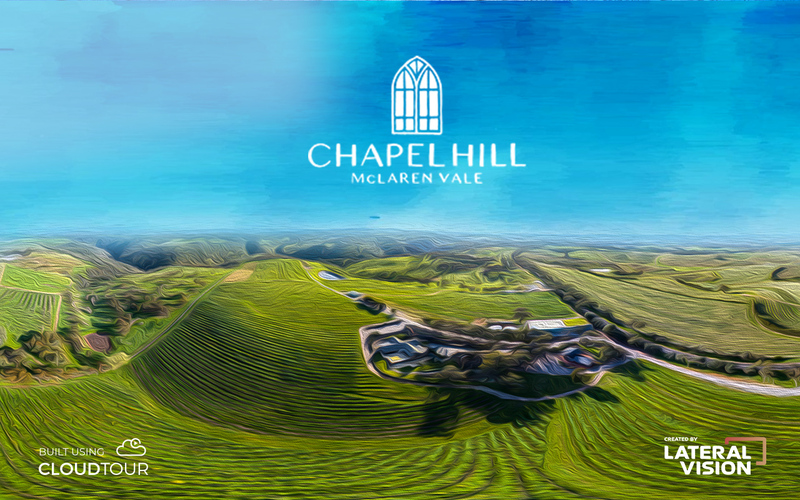 The Chapel Hill winery virtual tour allows users to explore their McLaren Vale vineyard from an aerial panorama, find out information about the vineyard and winemaking processes via information hotspots and purchase the wine online. The interactive virtual tour utilises 360 photography, drone photography and has been recognised with a marketing award. In 2015, Chapel Hill embarked on a major rebrand project, with an emphasis on storytelling. One of the major goals was to find an innovative and engaging way to tell their story of the grape growing and winemaking process. They also wanted to explain and show the quality and characteristics of their single block wines and their position in relation to McLaren Vale and surrounds. All work had to adhere to their branding guidelines and be compatible with any device. Our team captured a full virtual tour of the cellar door and function centre using HDR 360 degree imagery. A series of aerial panoramas were also captured. The custom CloudTour uses a single aerial panorama as its basis and incorporates information hotspots. The tour allows users to zoom in on all parts of the winery, the cellar door and function centre as well as the single site blocks and wine winemaking processes. If the single site variety is available, the wine can be purchased from the tour within 3 clicks. Chapel Hill can login and update the information boxes using our CMS. The full virtual tour of the cellar door and function centre is available for viewing on Google Street View and Google Maps. The custom CloudTour is available on the Chapel Hill website and across their social media platforms. International distributors for Chapel Hill wines have incorporated the tour into their staff training, including a version of the tour which is available offline. Comments received from consumers, trade partners, board members and distributors have been extremely positive. The online sales of single site wines have increased since the launch of the tour and the tour has been very well received on social media. This tour was runner up at the Wine Industry Impact Awards 2017 in the Marketing & Communications category. The overall engagement with the tour has been astronomical. The tour has strengthened Chapel Hill’s identity in relation to place and is a highly unique feature within the wine industry.